Howard Dean is also upset about the proposed compromise saying, “This bill is going to cost us a lot of money and it isn’t going to do anything, if this so-called compromise is true.” This is rather puzzling as, even with such compromises, the currently proposed legislation goes much further than the health care plan he proposed while running for the Democratic nomination in 2004. Is he then saying that the health care plan which he ran on would do nothing? Update: Matthew Yglesias posts essentially the same thing–still way behind me. 🙂 (I did steal the above graphic from his post). Update II: Also keep in mind that France, which by most measures has the best health care system in the world, does not have a public plan. To advocate for a public plan is one thing, but it is absurd to claim that it is not possible to have a worthwhile plan which does not include a public plan. Many countries successfully provide universal coverage with regulated private insurance plans. Posted in Blogs & Social Media, Democrats, Health Care. 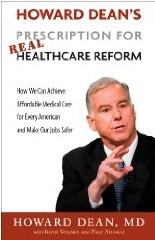 Tags: Health Care, Health Care Reform, Howard Dean. RSS feed for comments on this post.. TrackBack URL. Well, Howard Dean is a politician. When he was running for president (and as governor of Vermont) he was very much the proto-type for Obama… practical, pragmatic ‘liberal’ policy programs supporting an essentially ‘conservative’ approach to public policy. Not entirely a bad thing, in my view, though I think it can get in the way of aggressive action when such is necessary and can lead to sharing certain conservative dogmatic mental traps. It’s very possible he was speaking as politician, running for president, and is speaking his true views now. Or that he has genuinely revised his opinion in the four years since. While on the health care topic, I appreciated the link you showed me, I’m curious as to what you think about this one. I’ve already written a lot of my thoughts. I found a businessman’s take on the health care solution interesting, if it appeared flawed in several clear areas. I don’t mind that Howard Dean has changed his position from five years ago. What bothers me about Dean is the way that he not only has a different position but has been attacking people who hold views closer to his new position. It also isn’t the first time I’ve noticed comparable things from Dean when he has changed his position in the past. There are similarities between Dean and Obama. I’ve often divided Democratic races into two main factions–the more educated wing which often attracts the younger supporter and the more labor-oriented wing. Obviously there is not a clear line between the two. Using such a classification both Dean and Obama were the candidates of the more educated faction. They also share a general view of being more socially liberal and economically pragmatic. With these similarities it is interesting that Obama had no place for Dean after the election. I’ve wondered if this distasteful side of Dean plays a role in it. Regarding the article, it makes some valid points but its ultimate solution is unrealistic in expecting people to pay for the bulk of their health care expenses. People without chronic diseases don’t realize how expensive this is, tending to only think in terms of needing to cover catastrophic incidents. The best way to handle this is to spread the cost around to everyone, regardless of whether it is with comprehensive insurance or with a government paid program, so that those who need such treatment are able to receive it while everyone has the potential for coverage. In my opinion, and this is not meant as a knock on Obama even though I feel it did rob of him of some good choices in cabinet positions (I feel Wesley Clark, for example, would have been an infinitely more qualified SecState or SecDef than Hillary or Robert Gates), the Obama campaign set some ‘stars’ up as attack dogs and then distanced itself from their allegations as part of their political strategy. The manner in which this was done made it impossible (or at least difficult) for Obama to than approach these individuals with job offers. I found his notion of fair deductibles for ‘catastrophic’ coverage to be out of touch with what most people who don’t run companies tend to make, as well. I think he overestimates the amount of savings power of the average working American and the willingness of employers to sink money they save on health insurance benefits back into employee wages. I know that if my partner had been dependent on a catastrophic policy with a $50,000 decductible when she had her most recent illness, we’d have only been covered for $6,000. And there is no way we’d have been able to cough up fifty grand, despite her good job and my business that pays the rent. True. I have a high deductible policy (although certainly not anywhere near $50,000) because I can afford to pay a lot out of pocket when it comes up (and often office calls are written off as professional courtesy) but the average working person cannot pay for the routine care of diabetes or other chronic problems out of their own pocket. When the average person has to pay out of pocket they put off routine and preventive services, often resulting in higher bills in the future when this catches up with them. I actually think that both Goldhill, in that article, and most conservative advocates of more drastically Malthusian free market reform plans are counting on this. They appear to have the idea that the reason insurance costs and Medicare deficits are so high is that people are getting too much health care and running up irresponsible bills. I think they underestimate the need even the average family without one partner with epilepsy and the other with diabetes has to see the doctor regularly. I think it suggests that line of thought when his notion of government subsidized check-ups is one every two years. I know this is a broken record with me, but it always seems to be the people warning us against the nightmare of dystopian rationing who are the ones actually pushing de facto (or explicit) rationing schemes. True. Many conservatives do believe that the problem is too much health care services. While there are specific examples of this, overall the real problem is that far too many people are receiving too little. As on most other issues, conservatives also tend to try to bend reality to fit their philosophy. They therefore tend to blame those with the chronic diseases for their problem, exaggerating the role of individual behavior and ignoring the roles of genetics, infection, environment, and aging. Of course it is not only conservatives who engage in this. While I like his show, Bill Maher often has comments on health care which are every bit as ignorant as those commonly coming from the right. I’ve had a recent post on the pseudo-science which is common at Huffington Post. I read and commented on that post, and I’m certainly not of the notion that there isn’t plenty of idiocy on the left as well as the right. I just can’t drag my mind away from the fundamental right wing idiocy of trying to scare people with stories of diminished access and rationing in order to keep access diminished and implement rationing.